Charles was born in 1885 in Bottesford. Charles Baines was the son of John H. and Fanny Baines. John Baines was a journeyman miller, born in Newark, and his wife Fanny was originally from North Collingham, Nottinghamshire. His siblings were George, born 1880, Elenor, born 1883 and Walter, born 1888. All were born in Bottesford. 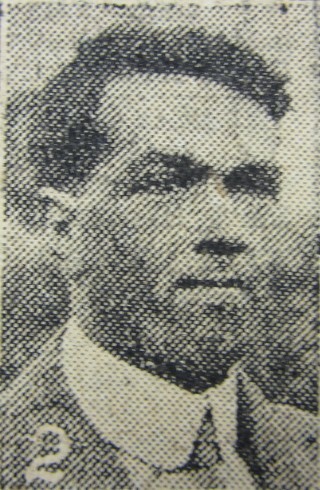 Walter Baines would also serve in the 1st World War. In 1891 John Baines worked as a miller and the family lived at Grantham Road, close to Easthorpe Mill. The family were still residing in Bottesford in 1901. Charles attended Sedgbrook Grammar School. By April 1911 he was employed as a Clerk to a hosiery machine builder and was residing as a boarder at 12, Richmond Street, Leicester. 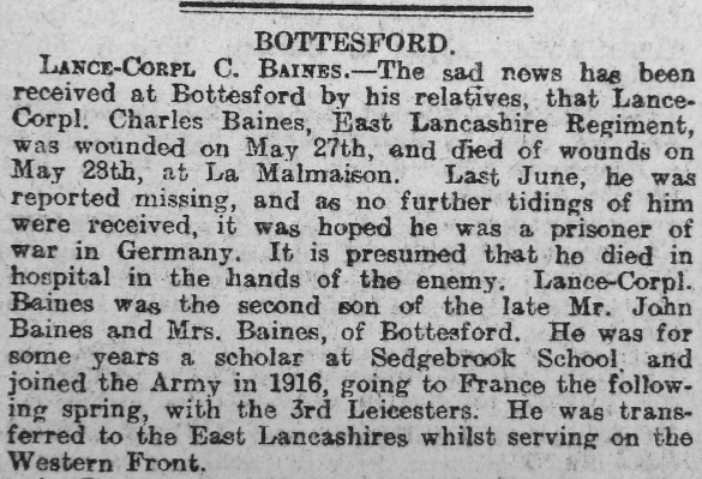 According to his obituary in the Grantham Journal he joined the army in 1916 and went to France in the spring of 1917. 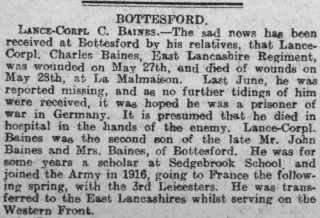 Initially with the 3rd Leicestershire Reserve Battalion he transferred to the 2nd East Lancashire Battalion whilst serving on the Western Front. This battalion landed at Le Havre on the 6th November 1914. 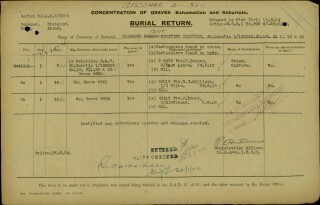 The Battalion records for 1917 are not available, however they are available for 1918. Charles Baines would have been with the Battalion in Flanders near the Belgian town of Poperinge for the early months of 1918. Most of the his battalion’s casualties were due to sickness rather than enemy action. The battalion also received reinforcements of 12 Officers and 267 men. The weather was bitterly cold and the men must have welcomed the move west to St Omer and a period of training away from the front line in Flanders. On the 21st March with no knowledge, except ‘wild rumours’ ,of a massive German attack on that day, they were moved 100 miles south to hold the west bank of the Somme. The Battalion War Diary states that the ‘enemy crossed the canal’. The last week of March and April resulted heavy losses as the Germans pushed on with their advance whilst Allied forces fought a desperate rearguard action. In the ten days days of action in March over 500 men from the 2nd Battalion, East Lancashire Regiment were listed as either injured, gassed, missing or killed. April saw a further loss of over 300 men. The Battalion’s move to the Aisne near Reims near the infamous Chemin des Dames would have been seen as respite from the intensity of action on the Somme. A three week period of reinforcement and retraining would follow. This relative calm would be short lived. On the 26th May the Battalion received orders ‘to be at 1/2 hours notice to move, as the Battalion H.Q had information of an impending hostile attack’. That night they moved up to the front line to relieve the 1st Battalion, Worcestershire Regiment. At 1 am they came under a blistering attacked. The Battalion would lose another 513 men in the next 5 days at the front. Charles Baines was one of those men. Arthur Conan Doyle in his volume published in 1919 “The British Campaign in France and Flanders” provides a graphic account. The German onslaught, though very cleverly carried out, was not a complete surprise, for the experienced soldiers in the British lines, having already had two experiences of the new methods, saw many danger signals in the week before the battle. There was abnormal aircraft activity, abnormal efforts also to blind our own air service, occasional registering of guns upon wire, and suspicious movements on the roads. Finally with the capture of prisoners in a raid the suspicions became certainties, especially when on the evening of May 26 the Germans were seen pouring down to their front lines. No help arrived, however, for none seems to have been immediately available. The thin line faced its doom with a courage which was already tinged with despair. Each British brigade brought its reserve battalion to the north bank of the Aisne, and each front division had the call upon one brigade of the Twenty-fifth Division. Otherwise no help was in sight. The bombardment began early in the morning of May 27, and was said by the British veterans to be the heaviest of the war. Such an opinion meant something, coming from such men. The whole area from Soissons to Rheims was soaked with gas and shattered with high explosives, so that masks had to be worn ten kilometres behind the lines. A German officer declared that 6000 guns were employed. Life was absolutely impossible in large areas. The wire was blown to shreds, and the trenches levelled. The men stuck it, however, with great fortitude, and the counter-barrage was sufficiently good to hold up the early attempts at an infantry advance. The Germans would sweep on forward. The Battalion withdrew to receive a further 714 men to replace those lost. Charles must have been taken prisoner and died of his injuries. Sadly his family would have to endure months of uncertainty before learning of his loss during the German spring advance of 1918. 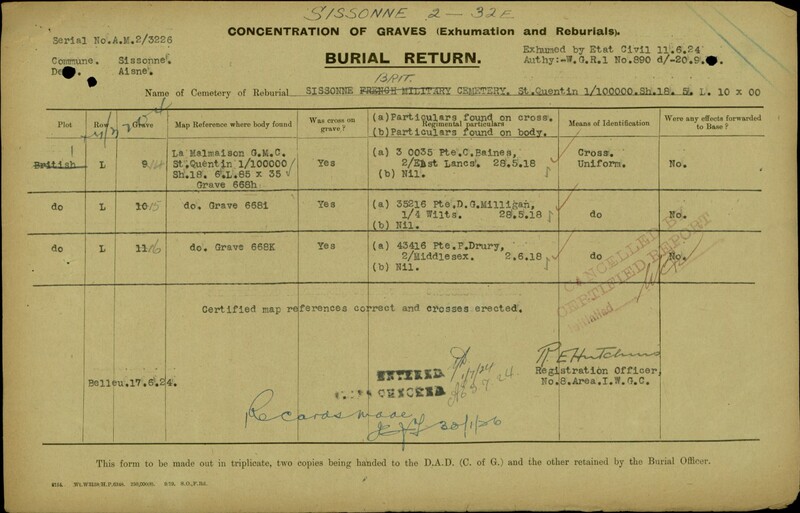 According to Commonwealth War Grave records he was first buried in the German Military Cemetery at La Malmaison, St Quentin. On the 11th June 1924 he, with two others (Pte D.G Milligan of the 1/4 Battalion, Wiltshire Regiment and Pte. 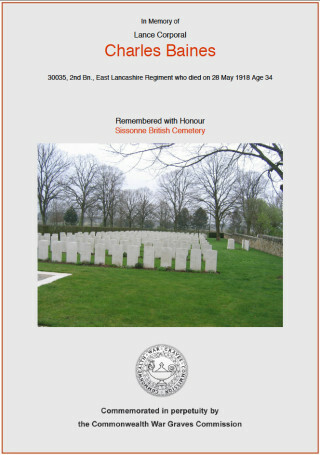 P. Drury of the 2nd Battalion Middlesex Regiment ), were reburied in the Sissonne Military Cemetery. Charles Baines left an estate of £663. 18s. 8d. He had appointed his is sister Florence (wife of Arthur Mills) and his brother George (now a miller’s foreman) to act as his executors. In July 1919 they would receive Charles back pay of £1.2s.10d.. However, the family would have to wait until 1924 before the final completion of arrangements concerning the execution of Charles’s estate. Taken prisoner and died of wounds.